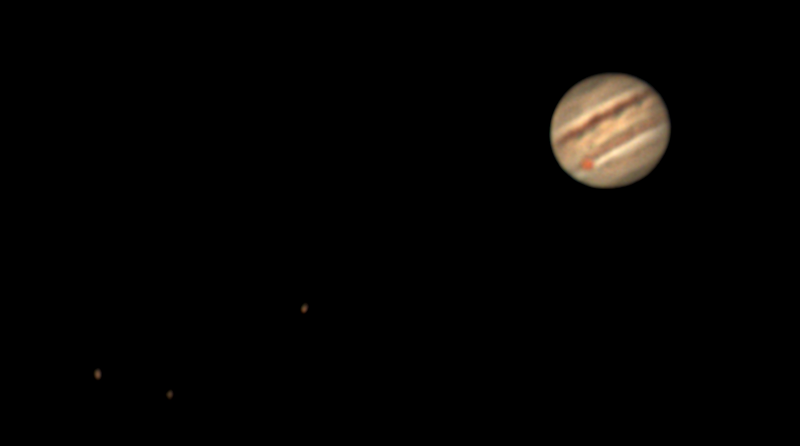 Not my best Jupiter but not a bad start, considering! Pre-dawn shenanigans with a mug of hot coffee, a thermally stable CPC-1100, a hairdryer and 2 very-awake dogs; under the ever-brightening sky and with the sound of blackbirds, so began my first foray into astronomizing for 2019. I was delighted to see that Jupiter is back again, it has seemed like ages. Venus was ridiculously bright, so bright that a gain of 79 was sufficient. 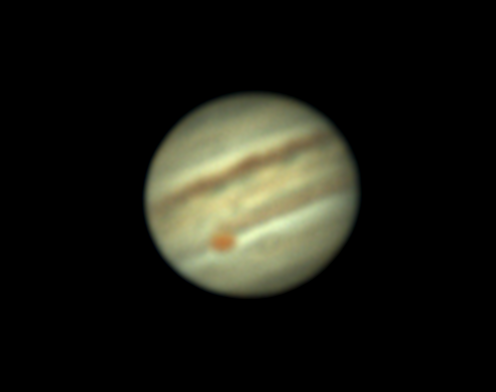 I was anticipating Jupiter images as poor as Joe Ferret's first 2019 Jupe, but I surpassed that easily. T'would have been nice to equal Darryl's "rank" Jupe, I should be so lucky. Jupiter was at a jaw-dropping 10 degrees according to Winjupos and Venus wasn't much better at 15 degrees. Fine focus was achieved thanks to the Jovian moons and my Moonlite focuser. 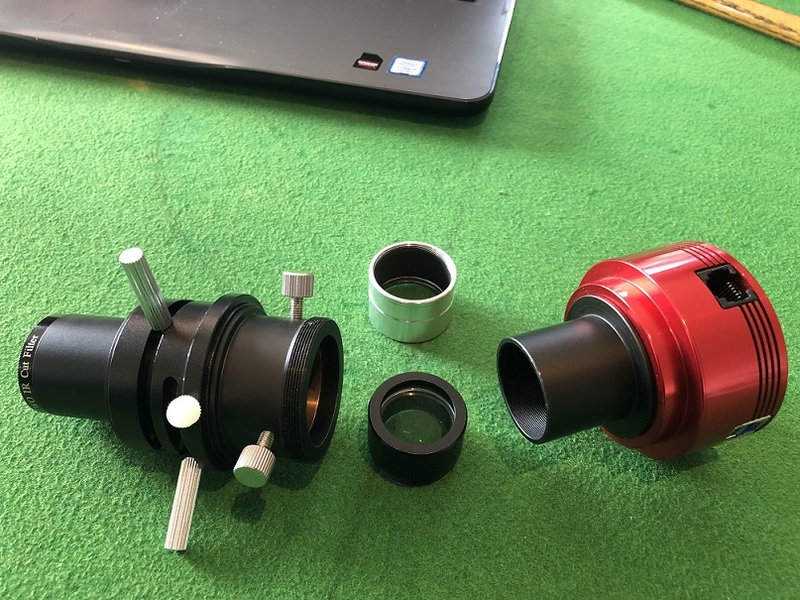 I didn't check collimation, I will next time. My suspicion is that unless collimation was way out, it wouldn't make a huge difference given the seeing and the planets' elevations. Here are Jupiter at f/18 and Jupiter at f/10. I'll post Venus in a follow-up comment. Very nice, Kevin! I was staring at these yesterday morning and was wondering what they looked like at present. I even used my fingers to stop down my eye and convinced myself I could see a crescent Venus. But it was facing the wrong way…your image is further confirmation! Not bad. Good to get back out there. With the 10-day forecast completely clouded over here (RIP eclipse viewing) I'm jealous of any images you're getting! Nice start, Kevin, particularly from your latitude! Thanks Grant, it was heartening to see Jupiter again, albeit wobbling and blurry (a bit like myself over xmas, if truth be told). 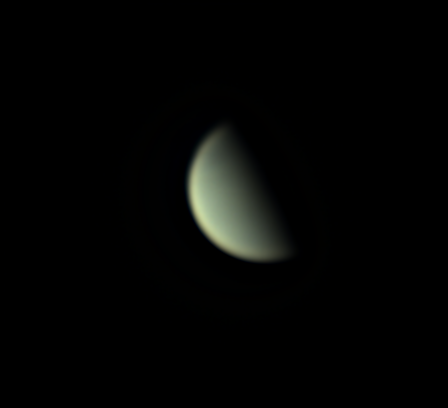 I've resigned myself to the fact that I'll never get detail on Venus, I've a 610 filter, but the seeing is always iffy here, anyway. Nice to see that that I could discern the darkening of Jupe's EZ, and that, while obvious, is something I could never have contemplated ever noting, say, two years ago. I sat down two hours ago and decided to cull some poor avi's I've accumulated over the past year, in order to free up some space on my USB3 hardrive, but have spent most of the time trying to improve the processing of same - the words pig's ear and sow's purse come to mind, although not in that order, granted. One thing I've just resigned myself to is that Drizzle, as in the AS!3 version, not the stuff that falls on Ireland regularly, is not for data that isn't bloody **** good. Am I right? I've heard that Drizzling can evince hidden detail to some extent (yes, I know, obviously detail that's there in the first place). Anyway, any imaging happening in your neck of the woods lately? Drizzling: it’s got to be doing some good because the stacking process takes three times as long, right? You might not be able to get details out of Venus but you can track progress of the terminator, which is interesting for some! Also a UV filter reveals cloud markings at a cheeky 250 euros! 3 times the wait and 1/3 the quality, here anyway, Mark. 250 euro for a few blurry smears, lol. The 610 doesn’t do it for me anyway, have you yourself had any success with Venusian cloud patterns? 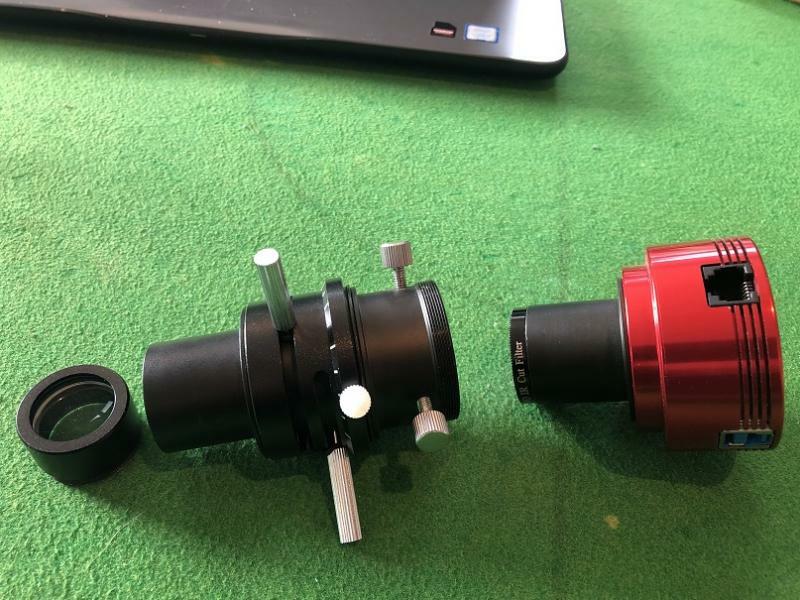 This winter, I've had the 81mm APO on the MX+, waiting for a combination of clear skies, no wind and a totally sober imager. That combination has not really occurred (mostly due to the first point), but I'm going to keep the small APO on the mount a few more nights - tomorrow night's total lunar eclipse is forecast to be paired with clear skies (and temperatures around -15 to -20 centigrade). So I'll be making an effort there. My bedroom has an ESE-facing window, so it's been frustrating to see Venus and Jupiter out there in typically-clear early morning skies - as I pack up to go to work! 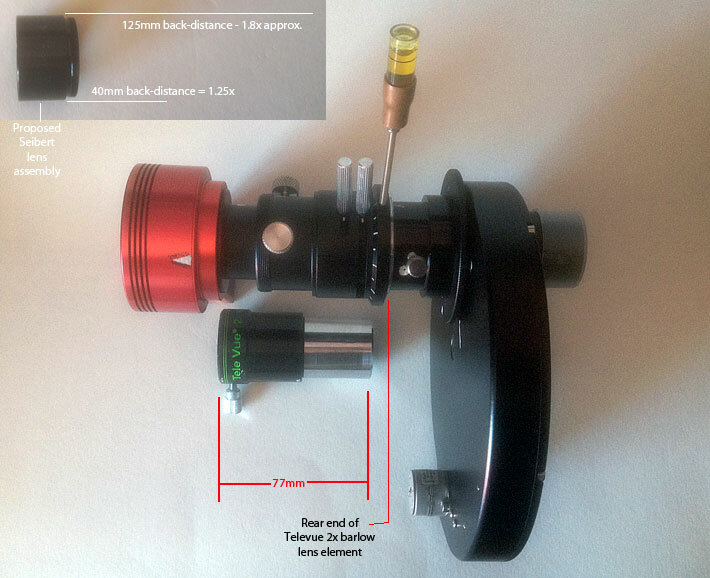 I plan to put the 12-inch SCT back on the mount probably end of February, by which time Jupiter will be clearing the trees at a reasonable elevation when still very dark. Weather permitting, of course! Yes, sorta, the chevron pattern showing up in UV. But you need to remove barlow and adc to get the fps up around 60. So, what filter exactly do you use to get the chevron pattern? Kevin, without any patronising whatsoever I think your first Jove for 2019 should be seen as a resounding success! I've just skimmed through the other posts in your thread but drizzling is only for good data anytime...only with very good captures does it provide substantial benefits imho. This way you might restrict the balrow's amplification to its native 1.5x if it had a reasonable "barrel" length after the lens section & the described setup keeps it to about the original barrel length - remember that the greater distance the camera is behind the ADC, the better the correction capabilities will be at low altitudes! We've observed this clearly & why I altered my train the other night...collimation is always a good practise, don't slash yourself with too many razor blades, try a star much higher up if necessary to get steadier atmosphere...better to get a better collimation up higher than no collimation or a really suspect attempt at much lower elevations, despite that of your planetary targets! * Obviously I'm not Frank, you can call me Darryl or Mo or K-man or whatever ...but I do really think that was a good "starter" for 2019 from you! Assembled, the train is like the pic in the next comment. Notice I haven't inserted the cam all the way into the ADC giving me about 15mm of an extension. Would you suggest further extending the distance from the cam to the ADC? Cheers for the feedback, I hope your aches and pains clear up! Thanks Mark. I think I'll pass on that for the moment! It's not often a mere mortal like me can get one up the legendary Ferret planet-buster himself, so I'll take credit where it's due! Here's the assembled image train, sorry, I thought I'd posted it earlier. Do you think I could benefit from extending the cam-ADC distance further? I believe that would depend on the effective focal ratio (or length)you're getting right now. There's no point in deploying a huge f-ratio if you have 3.75-micron pixels in your sensor. Seeing is oh so rarely going to be good enough to even get the most out of f/18 or so. I'd be trying for lower, like f/15. Grant, Kevin isn't looking to increase his image scale...he wants to ensure that there is a good distance between the rear of his ADC & the camera sensor: at lower elevations this makes a drastic difference to how well AD is corrected, something John Boudreau informed me of way back when - & it is clearly beneficial. Concomitantly, you want good correction for low elevation targets - if the ADC adjustments provide good correction (the coloured spheres in the FC tool able to be accurately aligned upon each other) then it is a non-issue...otherwise you might have to explore a different barlow option as I am doing with my email to Harry Siebert...atm our arrangement provides good ADC correction capabilities but I did feel that even with Jove at a small apparent diameter the images were too large...so I may have to move my camera closer to the rear of the ADC to reduce the scale - I can do this, but the correction capabilities might suffer...I won't know until we next get out there but the Siebert query is just as much a "fire-proofing" exercise against lower planets down the track if we're still breathing & moving! Thanks Darryl and Grant (apologies for only seeing your response now and hence not responding sooner). The ADC did an admirable job with Jupe@10 degrees, in that the dancing Firecapture circles were for all intents and purposes fornicating🤣🔭. So I guess I’m ok for the moment then! Mars was a stunning 42 degrees altitude earlier on, and while the capture session was comical with my laughing at a pathetic dancing pink blob on my laptop, incredibly some detail was extractable in Registax after a few iterations. Makes me feel great about 2020 or whenever it is that conditions are favourable here again, unless I relocate to Japan, again, which is unlikely. That said, there’s a holiday opportunity to 45 degrees latitude mid-France summer 19, but I don’t want to get ahead of myself. I’m interested to hear how the Siebert option works out. Mike Phileefan has one (he sold me the CPC, and I can’t wait til he’s tired of his Edge 1100 😂) and by all accounts they’re the business. And Grant, the foundations of my roll-off roof shed will be poured imminently, no doubt I’ll be in touch regarding that and more. The ADC did an admirable job with Jupe@10 degrees, in that the dancing Firecapture circles were for all intents and purposes fornicating. So I guess I’m ok for the moment then! I’m interested to hear how the Siebert option works out. Mike Phileefan has one (he sold me the CPC, and I can’t wait til he’s tired of his Edge 1100 ) and by all accounts they’re the business. I'm afraid a relocation to Japan is not going to be of much help. Unless you are relocating to Okinawa, Japan's mid latitudes will only be marginally better than Ireland. I'm waiting for 2023, when it will be 64 degrees apparent altitude here at ~40 degrees N. It will crack 50 degrees in 2022. Edited by gfstallin, 21 January 2019 - 12:37 AM. 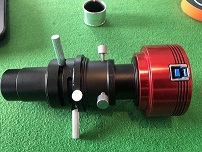 Can you let us know what Harry Siebert comes up with regarding the custom barlow? Edited by gfstallin, 21 January 2019 - 12:44 AM.